When the time comes to move, you won’t find a lot of people who are thrilled with that thought. Even though they are probably excited that they will be living somewhere else and because this moving represents the beginning of a new life adventure, moving is not just a mere changing of an address. It involves so many pre and post-moving preparations and tasks. One of the most tedious ones is cleaning, of course. And as boring as it can be, it is something you cannot just skip. So, if you want to know how to clean your apartment after moving out, follow our simple rules. Why is it so important to clean your apartment after moving out? Well, first of all, it is a right thing to do. Imagine you arrived at some place which is filled with junk, very untidy and not at all representative. Be sure that no one likes to witness the scene. Therefore, leave the apartment in the state in which you would like to find it. Besides, you will feel much better about yourself. Cleaning apartment is also an important task in case you have a security deposit. If you don’t properly clean everything, there is a chance that you will lose the right on a security deposit. It also speaks poorly of you. Since you are moving away, your new landlord might ask for some references. You won’t have any to display unless you clean your apartment after moving out. We understand that you are probably a bit confused about where to start from. Surely, you will need to find your own method that will work just fine. There are a couple of things to pay attention to when dealing with this type of task. Start from removing every single item from the house. If you still cannot transfer everything you’ve planned for your new house, then make sure to choose an appropriate storage unit where you can place those things. This storage unit will be of a great help to remove everything from the sight. This way, you won’t have too many items to slow you down while you get down to cleaning. 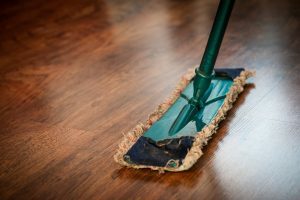 We are sure that one of the reasons why most people hate cleaning dust and sweeping floors is because it takes them too much to move everything to the side in order to clean those corners right. If you want to clean your apartment after moving out faster then we suggest you make a strategy. Remember the method we mentioned earlier? Well, now it is time to start applying it. Once you determine your weekly tasks and the way you are going to deal with them, it will help you stay focused. Furthermore, in this way, you will save a lot of time. Use this time to get done with other tasks that need to be finished before the deadline. Or you might simply use it to relax a bit. Either way, you will finish faster with this tedious obligation. The easiest way to determine how much and what you need to do is to go room by room. Have a piece of a paper ready and write down everything you find relevant. That is, write down everything you need to clean so that you won’t forget it by chance. If there are certain items that will stay even after you leave the apartment, then you should definitely include it in the list. Be sure that your landlord or new tenants will notice them first. After you have written down everything on the list, you can begin. And as you finish with something, put a check sign next to it. If this is your first time moving out, then it might be understandable if you forget about something. That is why we will give you a hand to help you do this better and stay focused while in the process of moving out. Inspect if there is something you need to repair. Everything needs to be properly functioning before other people arrive. If that is something that goes beyond your security deposit, make sure to write it down in order to pass the information to your landlord. Go room by room and see whether there are still any screws and nails in the walls. Perhaps you had some pictures or mirrors hanged. And perhaps your landlord wants to have all those nails out. Fix the holes and cracks. Since one of the tasks will be to newly paint the walls, it won’t look good if the paint gets stuck inside those little cracks. Call a professional to do this right if you feel you won’t be able to do it yourself. If you decide differently, make sure to pay attention to the smallest detail. 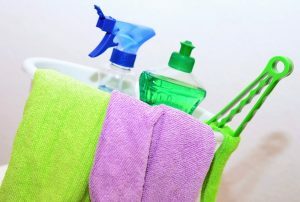 Get all the cleaning products you need. In order to make those surfaces shine, have the appropriate cleaning product for that kind of a surface. And of course, a spare cleaning rug and a sponge. If there are some persistent stains or scratches that won’t come out, ask for advice on how to best remove them. Be even more persistent in cleaning them than they are persistent in staying. Dust all the shelves and vacuum every carpet that stays in the house. Don’t forget about the windows. Remember to clean then them during a daylight. That way you can see whether some stains have still remained. 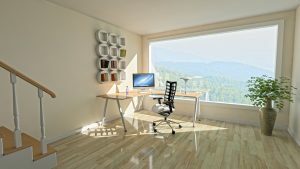 As you have noticed so far when you have to clean your apartment after moving out you need to plan your time in a good way. Then you’ll need to mentally prepare for it. But since this is something that’s obligatory, do your best to clean everything in the best way.